Honestly, at this point I'm thinking that there's two real options (excusing the one where Burk is Burk and that explains anything and everything about Burk). The first is that Burk has physical training, and a body suited for, on par, if not surpassing, that of the Justopea Royal Guards. As they have the ability to fight against Mages without magic, it's possible that their pure physical prowess is enough to overwhelm and, at least partially, negate the magic. The second is that Burk is a specialised Pandemonium Family Magic user, who's magic specialises in negating any and all magical effects of what he touches. We will likely never know which one is true (excusing the first one that I ignored because it's Burk's Reasoning and Burk's Reasoning causes issues). WELP, YOU'VE SEEN IT HERE FIRST EVERYBODY. BURK'S SECRET POWER...IS BEING BURK!!! BURK AHAHH!!! PUNCHER OF THE UNIVERSE!!! I subscribe to my own theory (forewarned I based this off off the discreet smattering of Grecian iconography in the comic) where Burk is basically a demi god, hold on don't kill me yet, let me list my bull-$h!t reasoning first. *First off, I theorize that Burk's father is a full blow god (just thinking) and swooned over Burk's Bad-A$$ pirate mom (crazy speculation here) and her charm of being a freaking pirate lord (they could also be used to explain some of Burks strength). *secondly, I believe that Burk's Brother is only his half brother on Burks father's side and is the "true child" (sarcasm)for the fact of Burk... um being a b@$terd, and the child of Burk's father's real wife (like Heracles's (and yes that's how you spell it) story but without the centaur blood poisoning at the end). This could also explain why his brother (Theorized by others to be the white haired crazy warrior dude) is able to topple empires (don't worry demigods are inherently stronger than their progenitors because their strength can evolve while God's are forever fixed). Lastly, the training, Burk's brother wants him to join the pantheon and trained Burk to have strength to rival the gods and once Burk was strong enough he was given something similar to Heracles's trials but Burk has to defeat all evil as a way for Burk's father's wife to spite him and with the very prevalent ideology of I must defeat all evil that encompasses Burk's candor everything starts to line up I mean regularly he follows the impossible task that makes the slaying of Cerberus look like picking up cat liter for an old lady on the weekends, this would also explain the very intriguing beginning with Burk falling from the heavens (nice biblical reference there neo subtle-deep)where in Burk is cast onto the road to godhood all of this could even explain why Burk switches attitudes on the flip of a dime he knows he has to do the impossible so he hides what could be apathy for the fact that evil can never truly end. Dude, punctuation! Like, half of it is missing, trying to read what you wrote was extremely uncomfortable. I hate "Burk" so much. I say "Burk" because I've seen the little images in the "latest page" box, this so called "Burk" is obviously an imposter. Anyway I think Atlas has a decent idea, I'd imagine "Being Burk" is justified in the same way one might refer to themself as "Being a god" for their power. Ariara's pant stripe changes red whenever she channels? I'm under the impression that magic defense only protects against magic and Burk has none, letting him bypass it. I suspect being magical even if you only use melee would still be affected by magic defense as with that blue stone guy. Burk is the answer to the ultimate question, not 42. Deep Thought parsed his name as numbers by accident. @Darius Drake. I personally think it's option 2, I hope we get to see the royal guards in some actual action against mages soon so we can compare. However I can't rule out option 3, now that you mentioned it, or Atlas's theory for that matter. We'll just have to see. HEy neo, just a shout out to this page cause it's AWESOME. And Ariara pointing out that Burk's pubches hit DAMN HARD is the icying on the cake. Good pacveing, excellent dialg, incredible facila expressions given you're dealing with pixel gfx! I guess I'll just change my name to Burk. Im starting to think that Burk is a title, not his name. As for the royal guards fighting mages, it's easy to see how the "super speed" they've displayed would allow them to defeat most mages. That ability might not seem that useful against Ariara in particular, but she might simply be one of those rare people who the royal guards wouldn't be able to handle. 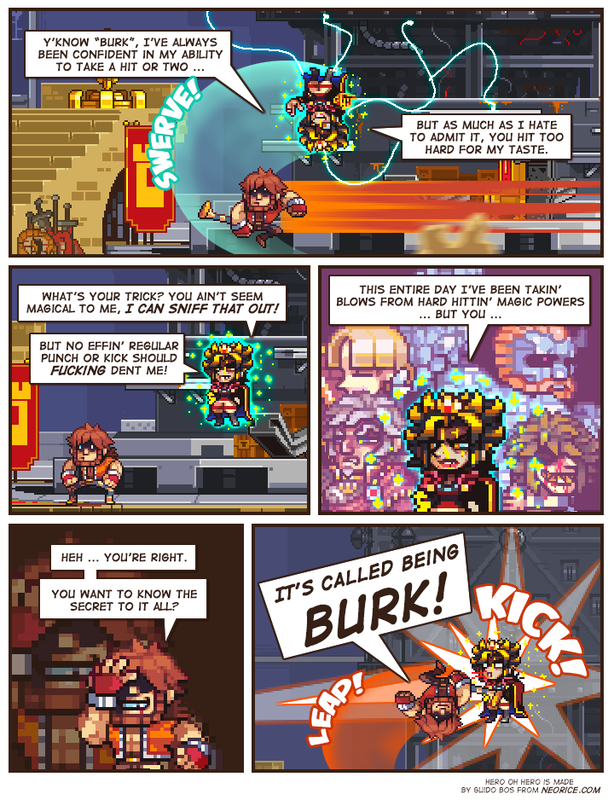 Burk may be just a fifth type or magic, or some natural force unknown till now. @re_cur sorry dude I was distracted, mainly because I ended up cropping 200 letters out because of the text limit. I actually had to nearly 50 words along with the cutting of most of the punctuation.